Thousands of educators descended on Frankfort to protest pension and education cuts late last month. During a news conference on Monday, Bevin criticized the statewide teachers union for organizing recent protests. “The issue isn’t the teachers. Teachers want to teach their children. The [Kentucky Education Association] has been a problem,” Bevin said. The KEA hasn’t called for teachers to take off work. 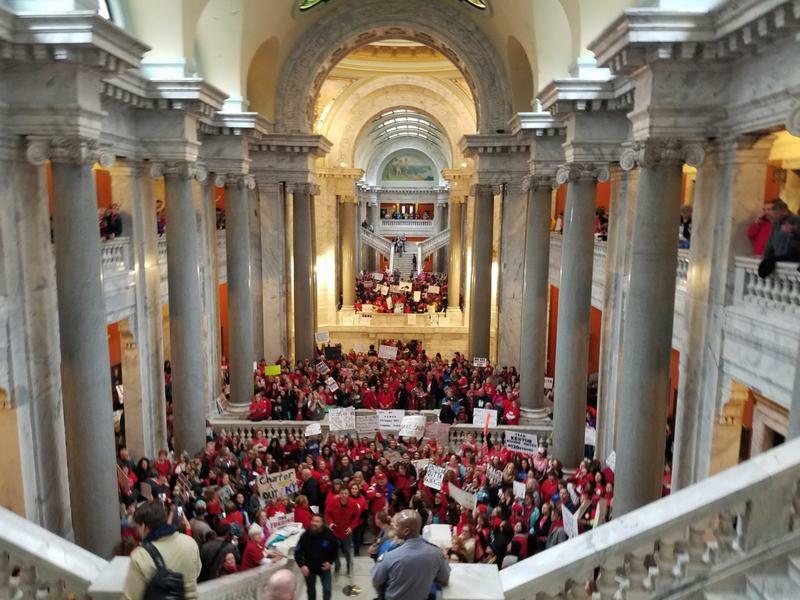 At least 12,000 teachers and supporters rallied in Frankfort last Monday, days after leaders of the Republican-led legislature rushed through a surprise overhaul of the state’s pension systems. The bill would move future teachers out of the conventional pension system and give them “hybrid cash-balance” retirement plans, which are similar to 401k-type plans. Teachers also won’t be able to use sick leave for retirement purposes after this year, capping the amount current teachers have accrued. Now the teachers’ organizations are rallying opposition to Bevin’s vetoes of the two-year state budget and revenue bills, which included more funding for education than the governor’s proposed spending plan. The KEA issued a statement saying the bills aren’t perfect, but still calling on the legislature to override Bevin’s vetoes. “The Governor should sign both bills and begin doing now what he should have been doing all along: engaging the legislature and the people of Kentucky in constructive, forward-looking, bipartisan discussions aimed at finding new solutions to the revenue challenges facing the Commonwealth,” KEA communications director Chas Main said in a statement. 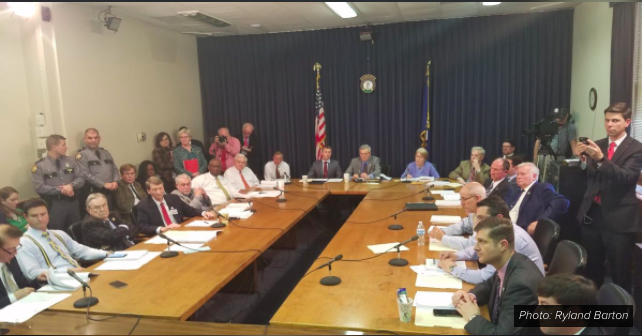 The Jefferson County Teachers Association also called for lawmakers to override the vetoes, but went a step further in asking its members to protest in Frankfort on Friday. “The Association does not agree with the some of the regressive ways the revenue bill generates new revenue, but without a revenue bill, Kentucky will lose hundreds of millions of dollars in funding for public education,” the organization’s Facebook page said. “JCTA asks every member who has a personal day available to please use the personal day to go to Frankfort on Friday,” the message reads. A teacher advocacy group in Pike County has also called for teachers to attend protests in Frankfort on Friday, according to the Lexington Herald-Leader. Lawmakers will have the opportunity to override Bevin’s vetoes on Friday or Saturday — the final two days of this year’s legislative session. If they don’t override the budget veto or pass a new budget, Bevin would have to call a special legislative session for lawmakers to pass a new spending plan.